Our second night in L.A., we ate at Yamashiro, a restaurant in a Japanese temple on a hill above Hollywood that suffers from the same plague as waterfront and revolving restaurants everywhere, banking on its view and offering food that could have been the height of luxury in some earlier decade but now feels vintage at best. We’d known that before going. We’d debated whether we should go to some more acclaimed restaurant we probably couldn’t have gotten into even if we’d tried. But the promise of the city lights spread out beneath us like galaxies had been too tempting. 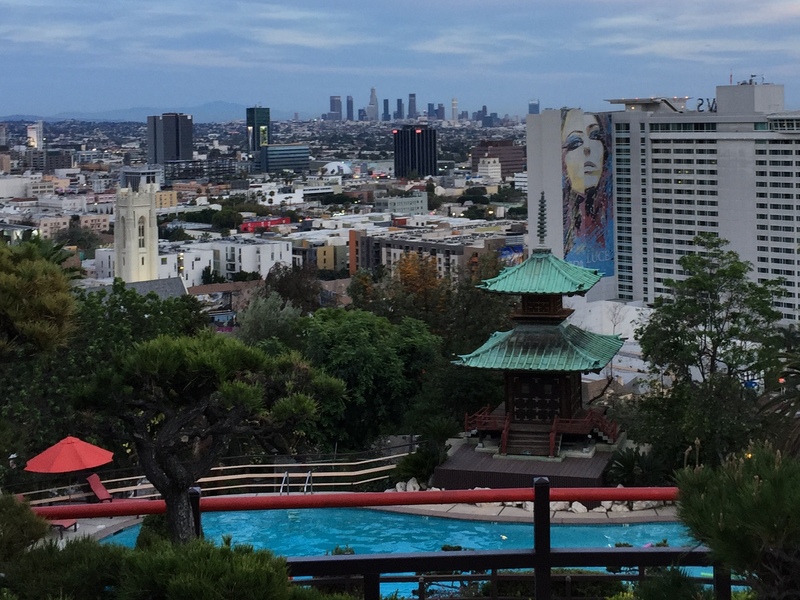 Roman Polanski called this city the most beautiful in the world, “provided it’s seen at night and from a distance.” From Yamashiro, it’s true. Built by brothers in the 1910s to replicate a palace near Kyoto, Yamashiro once had streams and waterfalls, a private zoo, a monkey house, even a Japanese village. It was a gem of the city’s Golden Age — Charlie Chaplin drank there — before falling victim to anti-Japanese sentiment, then disrepair, then finding new life as a dated restaurant. When I texted my mother a picture of Yamashiro, she wrote back, “L.A. is good for façades,” which I think pretty well sums it up. We sit in a corner now, in white upholstered chairs beside a vastly oversized white vase in need of dusting. 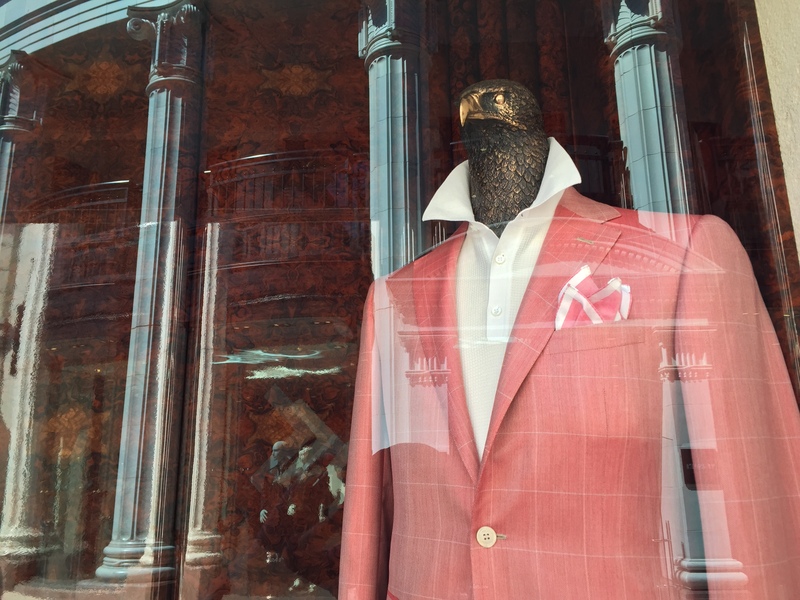 We look out over a low-ceilinged space of white walls, white tablecloths, white Corinthian columns, white faces, white dress shirts, and white blouses. The building across the street, visible through a white awning and white umbrellas, is white, and a Mercedes G-Class, white, stops at the valet stand on Brighton Way. I wear a blue shirt. Yours is blue and yellow. With the Chinoiserie blue sky, the palm trees, and the bottle of branded rosé sangria between us, we are bits of color too out of place in this tableau. You stop the waitress from removing the empty sangria bottle. We’ll keep it as a souvenir, you say. The waitress smiles. I’d tried to act cool, I’d tried to act the part, as if I belonged here, as if I could be one of them. But you gave us away. And yet they must have guessed already, from our wrinkled shirts, from our tousled hair, from our drugstore sunglasses, from the fact we’d had no car to valet. Even without the souvenir, they’d already known we’re only viewers here from some other place, not participants in this version of reality. Depending on your perspective, the best or the worst thing that ever happened to television was the 2007 writers’ strike, when the reality of reality TV caught hold of this city like wildfire. One of the biggest recipients of that gift was Lisa Vanderpump, the blithely fabulous, fifty-something, cool-as-taffeta-and-cocktail-jewelry ex-actress (A Touch of Class, Killer’s Moon, The Wildcats of St. Trinian’s, Mantrap), dancer (“It’s not how many times you fall, but how many times you get up”), and sometime restaurateur, who, in 2010, finally had her Norma Desmond closeup as a Real Housewife of Beverly Hills. Villa Blanca is Vanderpump’s restaurant a block off the most famous 2.5-block section of Rodeo Drive. “Life isn’t all diamonds and rosé,” Vanderpump famously says, “but it should be.” And, in this place, it can be, if the rosé is sangria and the diamonds are mirrors. Behind you, two sexagenarians in white blouses sip iced tea through straws, their foreheads smooth as satin, the tips of their noses turned up to God. The sexagenarians have faces that must be the handiwork of the “women’s health” surgeons around the corner, the ones with the solaria and the garden-level shops and the Carvel in the parking garage where bandaged socialites see reflections in Cookie Puss’s waffle-cone nose. To my right, a couple — they must be models or actors, we think — sit quietly, effortlessly aloof, lost in their phones and their costumes which alternately blur the line between hobo and Bob Mackie. Two children squirm beside them, itching to go out into the eternal California sunshine, but the parents are indifferent to them and treat them like they would a coat or a chihuahua or a watch picked up on Rodeo. In a neighborhood that prides itself so much on the façades they construct, the mirrors provide some sort of fitting symbolism. L.A. is a hard place to know because it’s always acting. 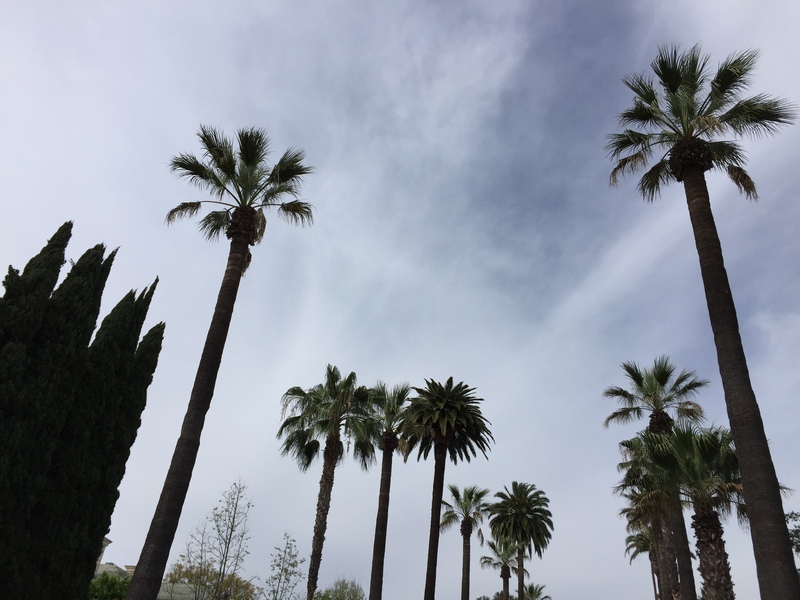 Our first day in L.A., after we’d snapped shots of the Theme Building and watched the tops of imperial palms fly by the taxi like emerald fireworks, we’d walked to Chinatown, Olvera Street, and Little Tokyo — a collection of old ethnic neighborhoods encircled by freeways near Downtown. At Olvera Street, roving mariachis wander along two crowded alleyways between stalls offering tacos and tamales and ladies in flouncy dresses selling magnets and postcards. This could be some old Mexican marketplace in this once-Mexican backwater except for the fact that it dates only from 1930. Olvera Street was unveiled that Easter as “A Mexican Street of Yesterday in a City of Today,” albeit one dreamed up by a bizarre socialite from Oakland, financed by Anglo businessmen, and built by prison inmates. L.A’s Chinatown, a few blocks away, is the weirdest Chinatown I’ve ever seen. 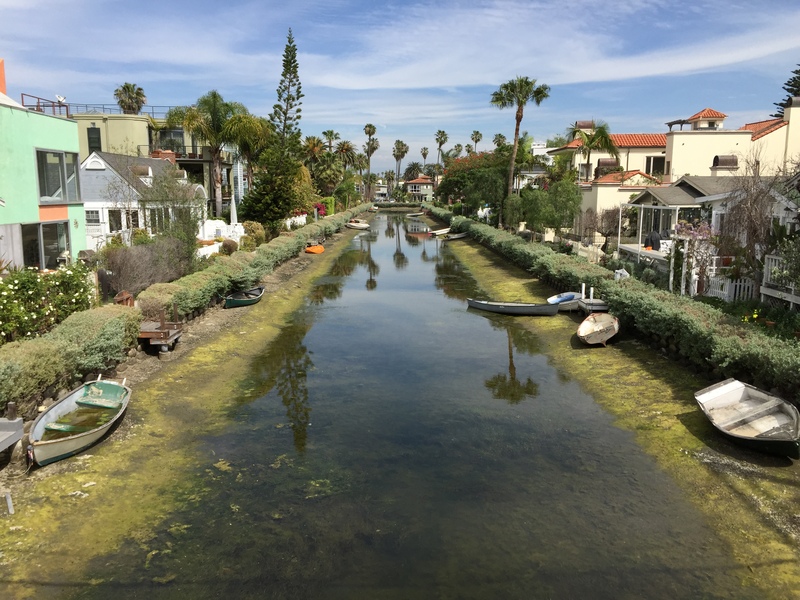 In the 1930s, when the city’s original Chinatown was torn to make way for a train station, a new neighborhood was built on the corpse of a Little Italy. Set designers laid out new plans. Even Cecil B. DeMille, one of old Hollywood’s more epic and flamboyant visionaries, was involved. 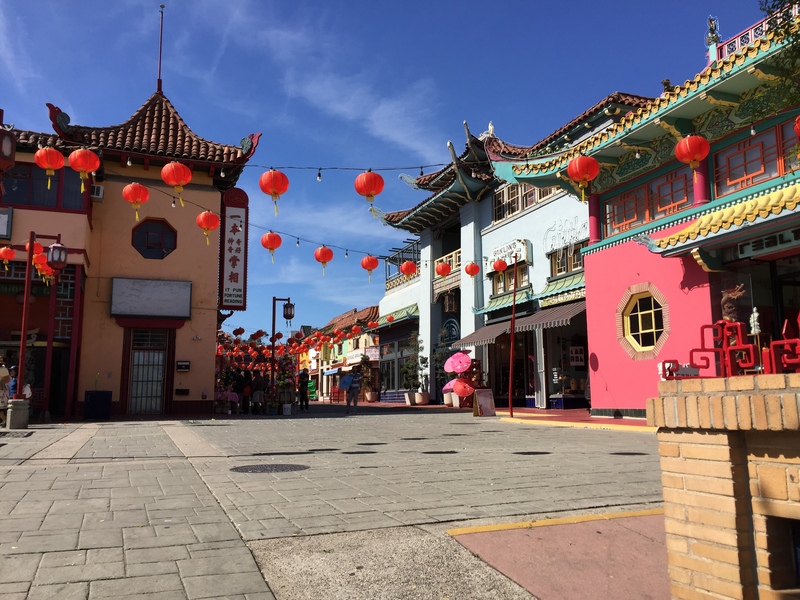 This Chinatown — New Chinatown — was meant to evoke some apocryphal fantasy of Shanghai, with red lanterns, pedestrian lanes, and a red velvet dive bar, Hop Louie, in a five-tiered pagoda. The same Oakland socialite who built Olvera Street built China City nearby, a neighborhood of rickshaw rides and set pieces left over from The Good Earth. China City eventually succumbed to arson in the late 1940s and was never rebuilt. 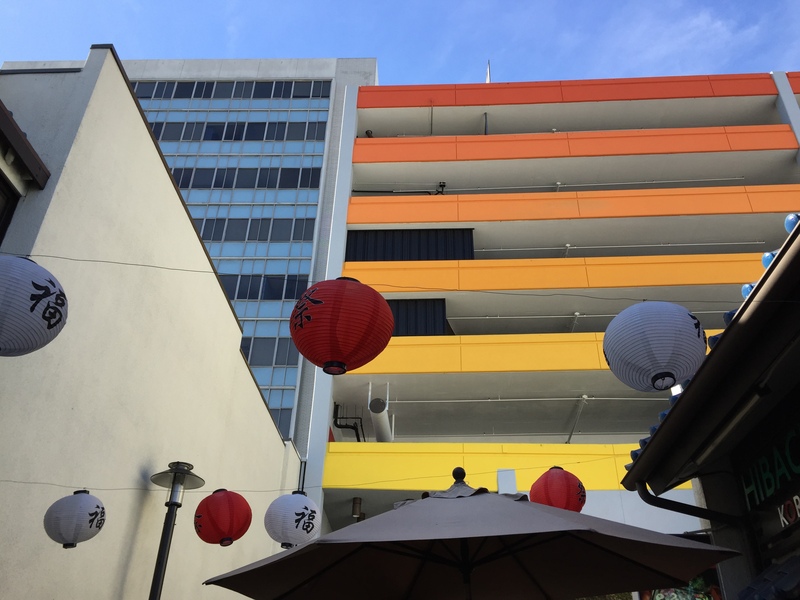 Like everything else here, Little Tokyo lies just across a freeway, a promise of exoticism just north of Skid Row. 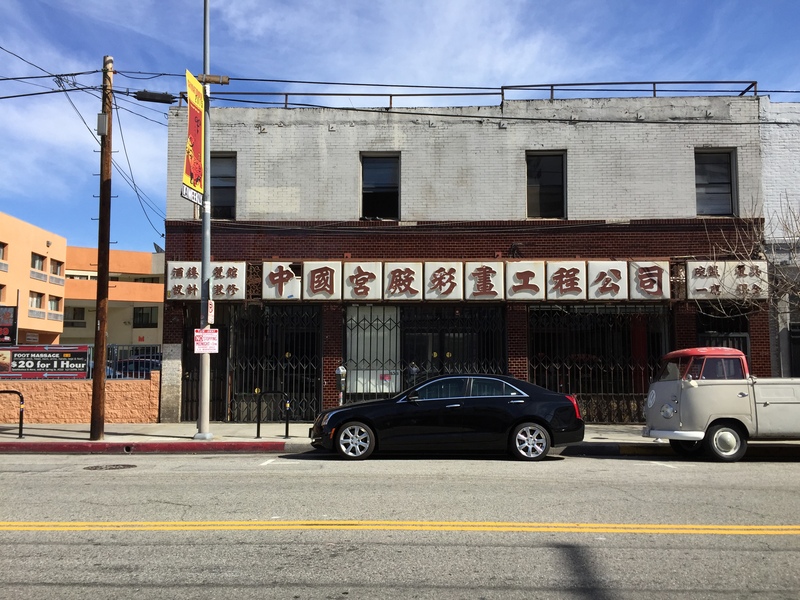 A neon sign — “Far East Chop Suey,” it says — lights up its entrance. Inside, we find a little warren of alleyways and lanterns, a red watchtower, and temples that harbor small restaurants and dimly-lit karaoke joints crouched beside an enormous orange parking structure. If we listen closely, we still hear a whisper of Japanese above the chatter of angsty Anglo teenagers dressed up like Sailor Moon. This is the birthplace of the California roll. Tokyo Kaikan, its creator, is gone now, but it’s ghost remains, and it was no trouble to find nori-wrapped avocado and crabstick on the creaking conveyor belts that were left behind. Our second day, from the Chinese and Egyptian theaters of Hollywood Boulevard, we trekked south to Sunset Boulevard, past the Church of Scientology’s Psychiatry: An Industry of Death museum, to the Crossroads of the World. Sometimes called America’s first outdoor shopping mall, the development is a mishmash of European and Mediterranean and Moorish cottages surrounding a 1930s ocean liner at the edge of a parking lot. It was quiet there, but peaceful and beautiful in the way of an old illustrated storybook you uncover in an attic, intended to evoke the exotic and the faraway for a population who hadn’t traveled. Wandering among the cottages and the minarets, we never guessed it was built by a gangster’s widow on the site of his assassination. Our tour guide, the John Waters look-and-sound-alike, pointed out cottages he thought resembled Heidelberg. Down on Hollywood, dead celebrities in rented costumes fill the footsteps of their predecessors. Elvis reads his email by the entrance to the metro. Charlie Chaplin holds the door for us at the hotel. Los Angeles is actually beautiful, sometimes shockingly beautiful. We weren’t prepared for that. We were always told it was an ugly place of freeways and billboards and power lines and desert scrub. It is all that, and it’s beautiful. We pick at our Caprese and our rare ahi salads, us drops of East Coast misanthropy in this land of bliss and sunshine. 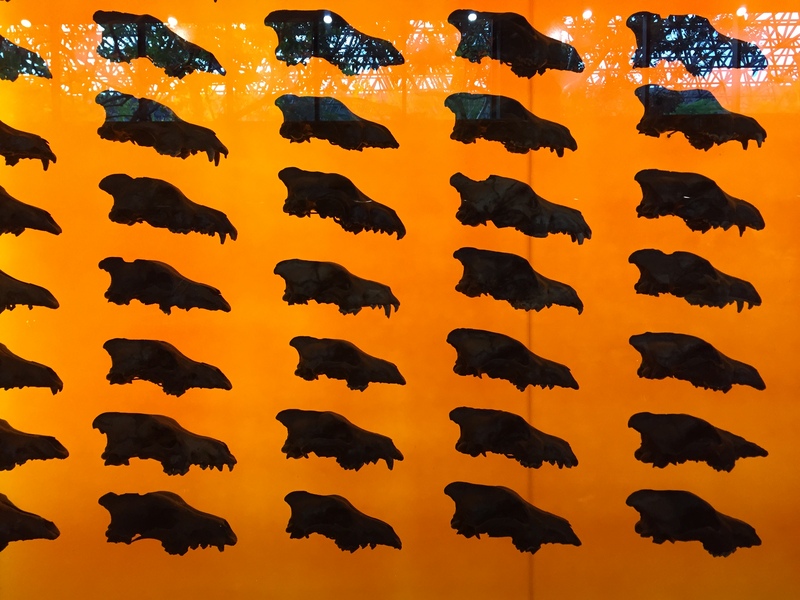 Sure, we’ll go see the La Brea Tar Pits nearby and marvel at the metaphor of this city finding its chief natural wonder in vats of bubbling asphalt. But, for now, here we are at Villa Blanca, just off Rodeo, surrounded by incessant beauty, looking for something behind it in the restaurant of a dowager empress of the Real Housewives franchise. We’ve always known the housewives to be as genuine as pro-wrestling. We came, I think, for affirmation. What we don’t expect to find, however, is that, in this place of great wealth and imagined cities, of Hockney pools and Spellings and Hiltons and Bret Easton Ellises, of McLaren dealerships and House of Bijan, there’s nothing particularly unreal about the Max Factored façade of a Beverly Hills reality star. What a fine piece this is. I feel like I’ve visited LA – and am also now, not sure I ever really want to. PS You had a Caprese salad at a Japanese restaurant? Glad you liked it! Caprese was at Villa Blanca, which I think they call Mediterranean.